At Saint John’s School, we believe in fostering individual talents from an early age. Research and our own hands-on experience, tell us that the exercise and refinement of fine motor skills is key to proper childhood development during the preschool years. At our Early Childhood Preschool Program, students regularly color, draw, write, cut, glue, tear, paint, model with clay and other manipulative materials: engaging regularly in manual activities that help develop visual-motor coordination. These same skills are also practiced throughout a broad range of academic areas as well. Early Childhood classrooms are arranged into play and learning centers, allowing space for both sharing and circle activities that encourage group socialization skills. Children are immersed in purposeful learning experiences and given ample opportunities to develop their physical, emotional, social and cognitive abilities. In addition, a theme-based, integrated Language Arts Program focuses on developing reading, writing, oral expression, and listening skills. A Guided Reading Program supplements the literacy programs from Kindergarten through second grade and a Spanish Language Program begins in Pre Pre-Kindergarten. All Early Childhood School students enjoy an innovative computer literacy program; a physical development program based on the concept of wellness; and a fully integrated arts program that embraces painting, drawing, sculpture, music, theater, and dance. Diverse community service projects are fully integrated into the academic curriculum at all education levels. 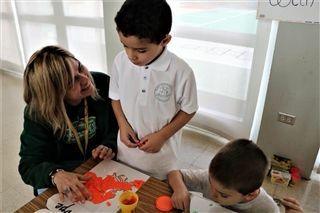 The Early Childhood Program at Saint John’s School encompasses all grades from Pre Pre-Kindergarten (for three-year olds) through second grade. The Upper Elementary School extends from third through sixth grades. All students enjoy a full day program beginning at 8:00 a.m. and finishing at 3:00 p.m., five days a week. At Saint John’s, we understand that music, movement and art are the language of small children and that daily exploration in these areas enriches a child's ability to communicate in a variety of ways. The Middle States Association Commissions on Elementary and Secondary Schools (MSA-CESS) recently recognized Saint John’s School in San Juan, P.R., for its Program of Distinction in Early Childhood Education. The Middle States Programs of Distinction initiative provides external validation of an accredited school’s accomplishments in specific areas of expertise and enables schools to take accreditation to the next level. The Programs of Distinction review process helps already accredited schools identify strengths and areas for growth and provides inspiration and recommendations for attaining a high quality program. MSA accredited schools are eligible to apply for Program of Distinction recognition for outstanding programs in 21st Century Skills, Global Literacies, World Languages, Visual Arts, Music, Early Childhood Education, Service Learning, School Counseling and STEM Education. The Early Childhood Education Program of Distinction recognizes schools that demonstrate dedication to early learning through a rich, child centered philosophy and best practices that focus on exploration, questioning, creativity and social-emotional development, as well as cognitive skills.